The headlines are a glimpse into Isabelle’s heart and mind. What she chooses to write about tells me something about what she values, what she remembers, what stands out to her about the week she’s had. Her headlines are the “highlights” of her year. And Isabelle’s headlines also tell me something about how she sees herself—she feels excited when she visits people she loves; she feels smart when she reads a book that’s above her grade level; she feels proud of the work she put into preparing for her dance recital. Recently her headline was, “Easter Girl Said Alleluia!! Crist is Risin [sic] Alleluia!” And as I unfolded that slip of paper I thought to myself, “Ah, she has been listening!” Because, you see, in our family we teach about Jesus and talk about the resurrection a lot. I always wonder if my words are getting through, or if they just sound like background noise. Isabelle’s headline reminded me that all those mornings of struggling for shoes and rushing out the door for worship are important. All of those Bible stories read before bed sink in, whether I notice it or not. Our moments of instruction and reflection (which are often met with blank stares) are planting a seed. Now, I’m not saying we’ve got it all figured out (by a long shot!) We are just a family, doing our best to help our kids learn about Jesus and experience Christ’s resurrection. It’s a lifelong process of learning, and one that we have to re-evaluate every step of the way. I’ll share some of the things that we are doing, and I’d love to hear in the comments about some of the ways that your family is teaching about the resurrection of Jesus at home! Even though some of those services are sad and difficult, it’s important for children—and people of all ages—to experience Christ’s betrayal and death in order to fully understand the power of his resurrection. The liturgies of the Episcopal Church are a great way to experience that progression, and allow us to “enter in” to each point of the story of Jesus’ final days. The words of the liturgy also help give voice to the things that we are experiencing but might not fully comprehend. 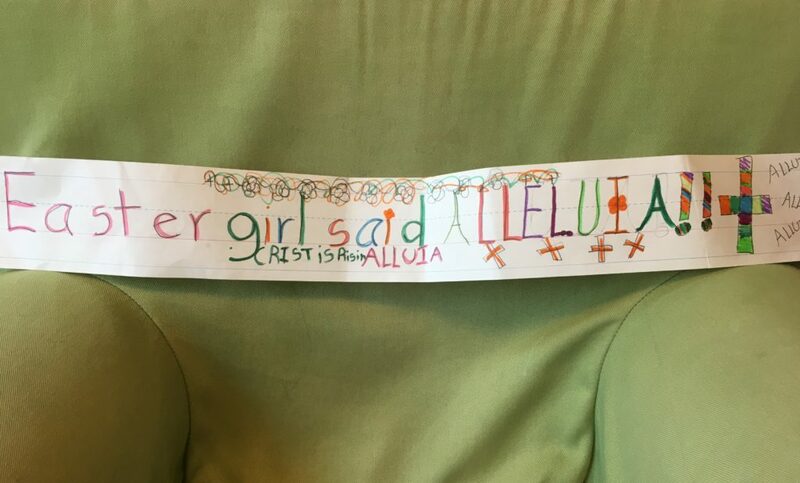 In her “headline,” Isabelle used the words of the Easter liturgy, “Alleluia. Christ is Risen!” as a way to proclaim her joy. That is the Church’s version of “Yay!!!!! Jesus is alive!” I love that she’s heard those words enough in worship that they have sunk down inside her, and are there for her to use. But we don’t just talk about resurrection on Sundays and leave it there. In our family, especially during Lent and Easter, we read the stories of the Bible. During Lent, we read the stories of Jesus’ life and death. During Easter, we read the stories of Jesus’ resurrection and appearances to his friends. We read them again and again; like any beloved children’s book they are more powerful with repetition. We read them from different Bibles and storybooks, so that we can hear the stories in a new way. And then, most importantly, we talk together about Jesus’ resurrection. We ask questions about the story, questions like: What do you notice about this story? What do you wonder about this story? I wonder how Jesus felt? I wonder what the disciples felt? What do you think God was thinking? How does this story make you feel? After we’ve wondered together, we remind our kids that the story of Jesus’ life, death and resurrection is the most amazing story of all, because it is true. And it’s not just something that happened long ago and far away. In church we say, “Alleluia. Christ is Risen,” not “Alleluia. Christ was Risen.” Because we believe that every time we walk through Holy Week together and read this story again, we meet Jesus there. And the Jesus who was raised from the dead on that day in Jerusalem is also alive, present, and here with us now. The power of Easter is that Jesus defeated death for ever. Jesus’ resurrection means there is nothing that can separate us from God, and that God in Christ is with us, here and now and every single day. It’s a crazy, amazing, powerful truth that even I, a priest with multiple degrees, struggle to understand. I can talk about it and try to articulate it, and explore it with my kids. I can show them, by my faithfulness in worship, that I believe this is both important and true. 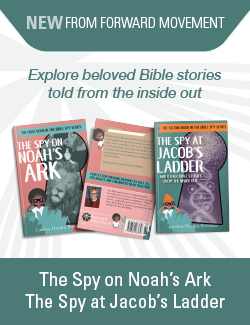 I can model for them, by my love of and engagement with these holy stories, that this is the greatest and most important story they will ever hear. And I can struggle to describe this truth, even when I know I do it imperfectly. But I think, on some level, my daughter gets it. Because she proclaims in her headline that she is an “Easter Girl.” In doing so, she teaches me about what the resurrection means. It is the event that re-creates, not only the world, but me. That re-defines everything I do and who I am—and who you are too. How does your family observe Easter all season long? How do you learn about resurrection together? What??!! indeed! That is definitely not the church’s teaching… how extraordinary! Praying my life reflects that I, too, am an “Easter Girl.” Alleluia!